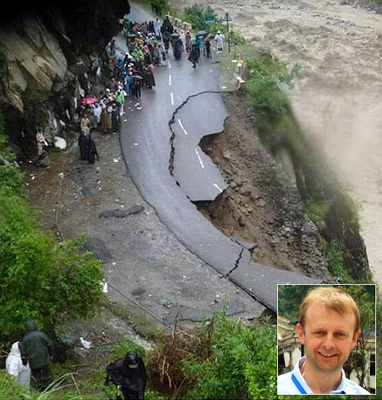 Dave Petley, dean of research and global engagement, Wilson Professor of Hazard and Risk at DurhamUniversity in the United Kingdom, has worked on landslides in the Himalayas since 2000. His blog provides a lucid analysis on landslide events occurring worldwide. Since the last fortnight Petley has been writing on Uttarakhand as well. In an exclusive e-mail interview with Rediff.com's Sheela Bhatt, he puts in perspective the extraordinary weather event of Uttarakhand that caused untold damage and misery. What is your take on the Kedarnath disaster? What is the scientific explanation for it? The scientific explanation is that exceptionally heavy rainfall caused two catastrophic events in the space of a few hours. In the first, water impounded behind moraine (the debris left by a glacier) broke through the barrier, causing a catastrophic debris flow. A few hours earlier, on a different slope, a large landslide triggered a debris flow. Both of these flows struck the town. You study landslides all over world. What is your understanding of the Himalayan range? Many reports said that if compared to, say, the Alps, the Himalayan range is young and so not settled yet. Is it prone to landslides? I have worked on landslides in the Himalayas since 2000 AD. The Himalayas are very fragile, much more so than the Alps. This is partly because geologically they are very young and are still being pushed up, partly because the climate is much more dynamic (in particular the monsoon can bring high rainfall totals in a few days) and partly because humans are much more vulnerable and less resilient. Thus, the Himalayas are in effect the global hotspot for landslide activity. Under what circumstances could the calamity have been averted? What kind of equipment and technology should have been in place before the event? The most important factor is that the houses and guest-houses should not have been built in such a vulnerable location. If they had been in a safer location then the tragedy would have been avoided. Simple approaches, like limiting development to safe locations, are much more effective than are warning systems. The National Disaster Monitoring Authority's chief had told me that the Indian Meteorological Department has not kept monitoring equipments in the Kedarnath area. How accurately can you assess through satellite images about what actually caused the disaster? High resolution satellite images are as good as photographs taken from a plane. They are good enough to be able to tell for certain what happened and in what order. This interpretation fits with the eye-witness reports. What is the minimum the Indian government can do to prevent high casualties in the landslide-prone area? First, limit development to safe places. Second, stop the wanton environmental destruction (especially loss of trees, the construction of poorly engineered roads, and the building of hydroelectric schemes without proper slope management). Better warning systems and clearly identified evacuation routes would also help -- it is clear that at Kedarnath the victims did not know where to go when the debris flows started. As per your theory glacier-induced flow hit the Kedarnath town and also, landslide induced debris came down. Any idea why glacier melted so much creating the furious flow? In general, around the world, glaciers are retreating (melting) as the world gets warmer. I do not know whether this is the case here, but where it is occurring, lakes often form that breach, releasing catastrophic debris flows. This is a dangerous situation. What was unusual in the event? For a town to be hit by two separate debris flows from different sources is unusual. This was clearly the largest such event since the temple was built, reportedly more than a thousand years ago. The largest debris flow for 1000 years is quite exceptional. As people say, it is " nature's fury". Do you find anything inexplicable? No, it is all completely explicable. This is just the landscape responding to exceptional rainfall. Around the world peak rainfall intensities are increasing, probably in response to climate change. While an event like this is unusual in the historical record, it will be less so in the future. It should also be noted that large parts of the Himalayas are overdue a large earthquake. Such an event would be even more destructive over an area hundreds of times as big. India should take notice of the Uttarakhand event and start preparing for a large earthquake. The difficulty of coordinating the response in Uttarakhand suggests that the country is ill-equipped to deal with a large earthquake in a mountainous area. The effects would be many times worse.